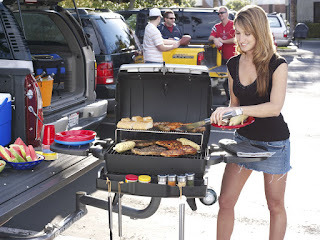 Why not standout at your next tailgate event. Whether your at your alma mater or cheering on your favorite NFL team, party a little bit healthier. We are getting ready to cheer on our favorite team, the Miami Dolphins, and we are bringing along some of our favorite game day munchies. A backyard barbeque all-star, Organic Brats, much healthier than its conventional counterpart. It keeps all the anitbiotics and hormones out of your brat and your body. Delcious Turkey Burgers are our next choice. Organic Turkey burgers are from turkeys that are fed 100% certified organic feeds, giving you the healthiest, most delicious bird your can get. Last why not add some organic beer! You cant have a successful party without our favorite social lubricant. Check your local Whole Foods as their organic beer offering are growing daily. Most important have a great time with your friends and be like the Revolution Greens team. Leave the place cleaner than you found it! Cheers!